Marion Barry, ‘Mayor for Life’ of Washington D.C., was a man who reflected his time and his place. He led some of the first lunch counter sit-ins in the country while a chemistry student at Fisk University in Nashville. 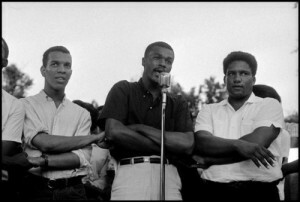 Then when the Civil Rights Movement finally coalesced, he left behind the pursuit of a doctorate at the University of Tennessee to work full-time for the Student Nonviolent Coordinating Committee, where he’d previously been elected its first chairman. But despite his dedication to nonviolent protest, Barry had an edge and could be intimidating, according to “The Nine Lives of Marion Barry,” a compact, powerful and entertaining doc about the man. Barry was also smart, tall and handsome, and remained true to himself, wary of being sucked into the “system,” eager to jump out of the car and greet D.C. residents often getting standing ovations when he arrived at a church service. Barry was skilled at identifying problems and expressing them in public on behalf of the community he represented. This was especially powerful because he worked in Washington D.C., an area where, before his arrival in 1965, the African-American community had no real representation or political say, partly because the district is not one of the fifty states. “Everybody and his mother knows that the police is the number one problem in America, and if you all don’t want to deal with that, that’s your problem,” says Barry in the film, identifying an issue that is paramount in the U.S. today, more than thirty years after he made this declaration. Produced and directed by two experienced documentary filmmakers, Dana Flor (“Cesar Chavez” for NBC) and Toby Oppenhemier (“Devil’s Playground”), “The Nine Lives of Marion Barry” is as rich and colorful as its subject. Crisp editing between his earlier days as mayor and 2004 when he runs for city councilman – a classic R&B soundtrack and vivid archival film footage – all help expose the inner life of this charismatic but somewhat mysterious man. He got caught smoking crack on tape in 1990 in a sting set up by the FBI. Why was he reelected mayor four years later? 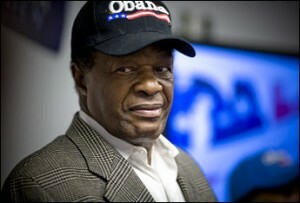 This is what many Americans think of when the subject of Marion Barry comes up. But his death at 78 last month has people thinking about what his life really meant to America. Two points are clear: He was a civil rights leader and a pioneer for African-Americans in an uncharted political landscape, establishing an important base of political power and jobs for blacks in an area once basically overseen by a racist Southern senator, according to the film. Perhaps more importantly, Barry loved the people and most of the people loved him right back. Watch this IndiePix film yourself and try to figure out what made Mr. Marion Barry tick. This entry was posted on Monday, December 8th, 2014 at 6:12 am	and is filed under Film Reviews, Home Featured One. You can follow any responses to this entry through the RSS 2.0 feed. Both comments and pings are currently closed.